Product Description 1 Liter High Performance Centrifuge designed for a variety of medical, industrial, and scientific applications. Designed to meet your separation and concentration requirements. 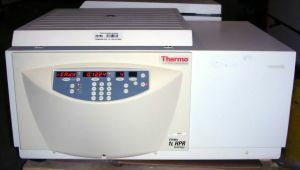 Refrigerated model provides a temperature range from -9C to 40C (15.8F to 104F). High-speed, multipurpose benchtop centrifuge offers multiple power configurations for worldwide use. They accommodate swinging bucket and fixed angle rotors (not included, to be purchased separately) and can process a variety of tubes, bottles, and microsample tubes. Maintenance-free, brushless motor is permanently lubricated for efficiency and quiet operation. Acceleration and braking rates may be controlled to optimize runs. Repeat runs, with the same speed and time settings, are achieved by the touch of a button. Fail-safe cover interlock ensures that the cover is closed before a run can begin and keeps the cover closed for operator safety. Rugged steel cabinet construction ensures quiet operation and long term reliability. Automatic circuit breaker protects the centrifuge from damaging power surges. Suction feet anchor the centrifuge to your work surface to maintain stability and prevent "walking." Fully automatic rotor recognition system internally detects and identifies the rotor installed to ensure that prescribed safety limits are not exceeded. Programs can be locked to avoid unwanted parameter changes. Easy-to-use Enviro-Scan Microprocessor control panel provides two convenient modes of operation: Manual and Program. Manual is used to enter the temperature (refrigerated models only), speed/force, and time for individual runs. Program is used to define and save run parameters that you want to recall and reuse. Up to 99 specific sets of run parameters may be programmed (98 sets on refrigerated models). Programs are retained in non-volatile memory. Five versatile timing modes include At-Start, At-Speed, Continuous Operation (Hold), Centrifugal Integrator (replicates repetitive runs), and Momentary Spin (Pulse). Speed can be selected from 500 to 16,800 RPM in 50 RPM increments. Force can be selected from 50 to 30,300 xg in 50 xg increments. Speed is shown within 100 RPM and never requires calibration. Heat Output . . . . . . . . . . . . . . 2700 BTU/hr.